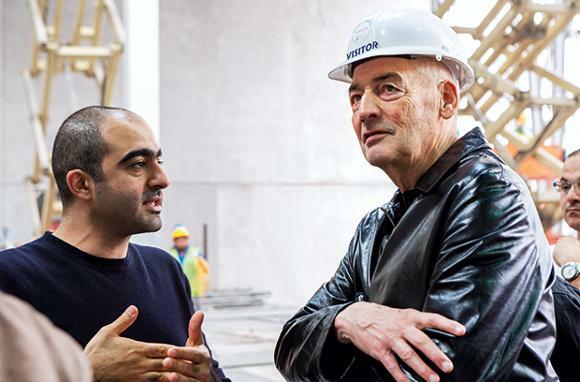 Rem Koolhaas is clearly a very busy man. Although his team confirmed my request for an interview, since 8 in the morning, thrice has it been rescheduled – from 12 noon to 11am then 10.30. Determined to meet the highly respected architect - starchitect, according to some - and author at any cost, I leave office at 9.30am when I get yet another message from his assistant. ‘Can you be here at 10am?’ she asks. ‘Here’ is Concrete, the first completed project by Rem’s company OMA (Office for Metropolitan Architecture), in the UAE. Located in Alserkal Avenue, the art and culture district in Dubai’s Al Quoz, the mixed-use space for art exhibitions and the like opened last month and is already becoming a magnet for events. A metro ride - to skip the traffic - a taxi ride and a brisk walk later, at five minutes to 10, I am in front of the brand new, 600sqm hangar-like, shiny – thanks to the translucent polycarbonate cladding – Concrete. Created to host large-scale art exhibitions, conferences and corporate and private events, Concrete, to a novice’s eyes, might appear to be modest by Rem’s standards. But enter it and you will notice hints of master touches subtly sprinkled all through – double-height ceilings, movable walls, slender lighting and skylights. And in perhaps a nod to the name, the rear and side walls are sprayed with dark concrete studded with fragments of mirror. On the day I am to meet Rem, an exhibition titled Syria: Into the Light’ portraying Syrian art from 1924 to 2016, is on, and a steady stream of art enthusiasts are trickling into Concrete. Since I have a few minutes to spare, I walk around attempting to understand some pieces of modern art before an OMA staffer chaperones me to a small but brightly-lit office tucked away on the first floor to meet with the man who Time magazine said is one of 100 most influential people in the world. Tall, lean, even athletic-looking, Rem has a purposeful air around him as he issues directions to his staff regarding his flight plans for the next day, before offering me a firm handshake. After a quick comment about the local media’s coverage of the recently concluded Dutch elections – ‘Gulf News had a lovely in-depth piece’ – he dives straight into the topic that is so close to his heart and his first project that materialised in the UAE. At first glance, Concrete might not appear to be as radical or unusual as several of his other much-discussed and written-about works, such as the Casa da Música concert hall in Porto, Portugal, which the New York Times said was ‘…one of the most important concert halls built in the last 100 years’. Or the award-winning Embassy of the Netherlands building in Berlin that architecture critics said was structurally ‘obedient and... disobedient’. Or the Seattle Central Library, which was called ‘a masterpiece of public space design’ although a few critics also said was ‘cheesily detailed’. Some of Rem’s works have also been termed as ‘threatening set ideals of architecture’ and ‘audacious’. Does he agree with these terms? Dynamism and unorthodox perspectives are definitely a hallmark of the architectural firm OMA that he co-founded with Madelon Vriesendorp and Elia and Zoe Zenghelis in 1975. Ready to take on just about any project that allows him to push the boundaries of design, Rem, who has designed master plans for suburban Paris, Hong Kong and even a museum city in Sharjah, among others, refuses to allow himself to be pigeonholed or be predictable. For instance, when a Parisian client wanted a house with two separate apartments – one for the parents and one for the daughter – that offered panoramic views of Paris and the Eiffel Tower, Rem created the house as a glass pavilion containing living and dining areas with two hovering, perpendicular apartments on either ends. He also had a swimming pool placed on the roof. Closer home, in Qatar, OMA designed a modern diamond-shaped library as part of the education city, in which the floor appears to tilt gently upwards from each side of the entry ports. A futuristic library dedicated for children and teenagers is the highlight of this structure. Having designed buildings and created master plans for cities almost all over the globe – from China and Japan to Hong Kong, US and Europe – does he approach architecture differently in different parts of the world? ‘Oh yes, architecture is different in every one of these places. The client relationship is different, the government regulations may be different, the legal system is different, procedures for finding contractors is different... There are huge differences. But rather than trying to produce the same kind of results everywhere, we try to engage those differences and try to see what they mean and how we can participate with energy, integrity and precision in each different context,’ says Rem, who designed a residence in Bordeaux in 1998 that was declared a protected monument as soon it was finished. The designer of the highly acclaimed Guggenheim Hermitage Museum in Las Vegas admits that when it comes to planning a city, parameters could be different. Does he have a template or a plan for an ideal city? A designer who believes that rather then architecture changing the world, the world should change architecture, Rem started off as a scriptwriter for films – he co-wrote The White Slave, a dark Dutch film – before becoming a journalist then moving on to study architecture in the UK and the US. Quick to admit that his time in media came in handy when he began pursuing architecture, he says: ‘They [journalism and films] helped me to articulate my ideas simply because I think if you are able to write down something clearly then that is a big asset in architecture. ‘What I think movies are is actually a series of episodes which need to be put in a particular sequence so that a good story emerges. Building on the same theme, he believes architecture is a continuation of journalism ‘in the sense that nothing allows you to enter a cultural situation better than architecture. With Dubai being such a melting point of cultures how does he foresee the emirate 50 years from now? ‘Very difficult for me to say,’ says Rem. ‘I don’t know to what extent the internet digital condition will really change life. That is a big question. And his favourite buildings in Dubai? Known for often looking at established conventions from a completely different perspective, Rem once said that his life story is one ‘of running against the current and running with the current’. At this age, is he tired of running against the current or does he find it fulfilling? Rem leans back and laughs. ‘I admit that sometimes we occasionally challenge a lot of received wisdom but it’s not that we run always against the current. What else stimulates and inspires him?